When faced with a dirty, moldy, humid crawl space, you will have various choices to keep it dry and clean. Many waterproofing experts will recommend crawl space encapsulation as a long term solution for your crawl space woes. 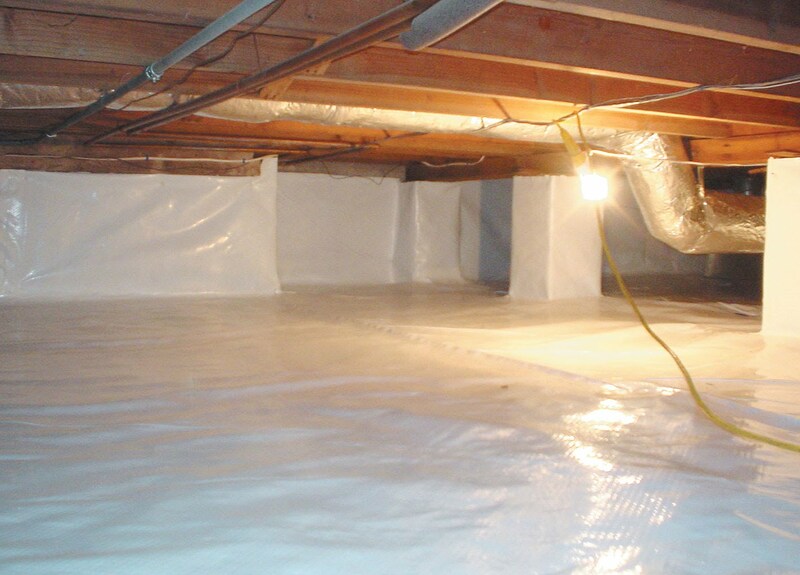 This involves the installation of a vapor barrier that will close off the crawl space completely. Nothing from the soil or the environment around the home will be able to access the crawl space. Now that you’re convinced that crawl space encapsulation is the best option for your home, you may be wondering what to expect from the process. Before the barrier is installed, the area must be prepared. This may include protecting the area from vermin as well as fungi. The space is inspected and if required, treatments for fungi and vermin are applied. A drainage system will have to be installed if there is evidence of standing water. This will ensure that water does not collect under the vapor barrier once it is installed. The floor of the crawl space is also prepared for the installation of the vapor barrier. The method used to prepare the floor will depend on the contractor and the system being installed. When the space is ready, the vapor barrier is installed. All seams are sealed tight to keep moisture out. This also ensures that the air from the outside cannot enter the crawl space. A system for circulating air in the space is then installed. This may involve the use of your current HVAC system or the installation of an exhaust fan. If your home is an area with high levels of humidity, a dehumidifier may be required. Now that your crawl space is fully protected, what can you do to ensure that this remains the same for the long term? Although the space is completely closed off, regular maintenance is required to ensure that the space maintains this level of dryness. It is important to have your HVAC system inspected and services at least once a year especially if it is connected to your crawl space. Hire a technician that understands this interconnection of systems to ensure the best results. It is also important to have a technician from the waterproofing company check the integrity of the vents, barrier and seals annually. An inspection of the drainage system and the exhaust fans is also necessary.